The general critical consensus is that Tonight represents the nadir of David Bowie’s career, the only true stinker in his discography. It’s been described as a quickie cash-in on the Let’s Dance formula, a concession to his new ‘Phil Collins’ audience, a charity album for Iggy Pop. Only three years after its release, Bowie himself was virtually disowning it. But it’s a fascinating, occasionally superb collection by arguably the greatest album artist in rock history. David tries out a lot of styles and gets away with most of them. And it could have been a lot worse. So I’m putting it squarely alongside Heathen, Black Tie White Noise, David Bowie, both the Tin Machine studio albums, hours… and several others in the second tier of DB albums. In the summer of 1984, Uncle David was competing with the shiny British New Pop acts of the era – Duran, Wham!, Culture Club, Thompson Twins, Nik Kershaw, Howard Jones, Frankie, Bananarama – and to some extent beating them at their own game: Tonight went straight in at number one on the UK album chart on its release. 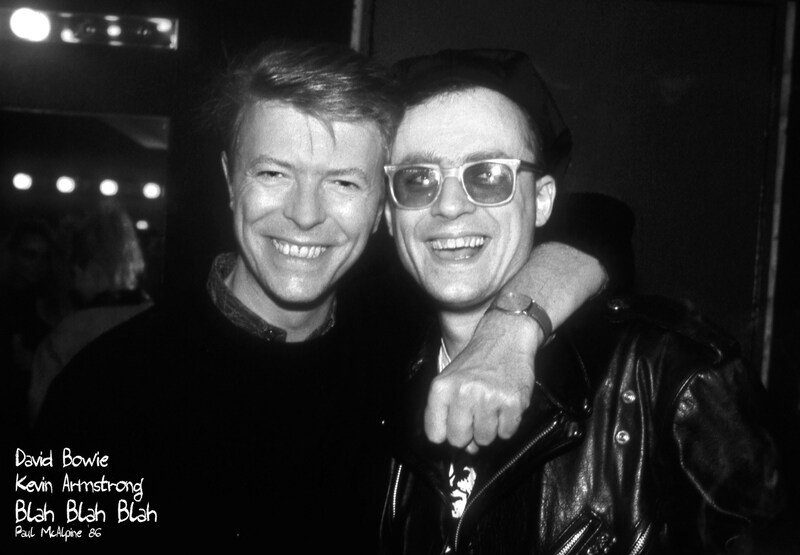 But writer Nicholas Pegg made an interesting point about its sound in his ‘Complete David Bowie’: David was apparently more taken with the ‘straight’, poppier artists of the era than edgier acts such as Bronski Beat, The Smiths, The Cure, Marc Almond etc etc. Tonight took five weeks to record, two weeks longer than Let’s Dance. It was tracked in Quebec, Canada during May 1984, only a few months after the end of the ‘Serious Moonlight’ tour. Lenny Pickett’s Borneo Horns were retained from the live dates and there were some holdovers from the Let’s Dance sessions: Omar Hakim on drums, Carmine Rojas on bass, Sammy Figueroa on percussion. But Nile Rodgers wasn’t asked back to co-produce (it’s oft forgotten that David was also a great producer). It was a decision which apparently baffled and disappointed Rodgers. Instead, ex-Heatwave bassist Derek Bramble was brought in on the strength of his work with Lynx, David Grant and Jaki Graham. He probably hoped he would be the new Nile, but it wasn’t to be. He played some great bass, guitar and synths on the basic tracks but was given the boot only a few weeks into the project. Police/XTC/Peter Gabriel/Genesis man Hugh Padgham – initially only employed as the engineer – was asked to finish off the album as co-producer. Hugh has since expressed dismay at the choice of songs, saying that a few new Iggy/Bowie compositions were left unfinished (perhaps later used for Blah-Blah-Blah) because Bowie ‘couldn’t be bothered’ to finish them. It’s hard to disagree – if ‘God Only Knows’, the title track and ‘I Keep Forgettin’ had been replaced by some new tunes, Tonight could have been a corker. But it ain’t bad. And the critics all pretty much loved it at the time. It may have been a huge shock if you were brought up on Ziggy Stardust and Hunky Dory, but I came in around Scary Monsters. It seemed a natural progression. Mick Haggerty’s sleeve design splits opinion too – it’s either a witty Gilbert & George pastiche or a garish bit of mid-’80s tastelessness. Judge for yourself. 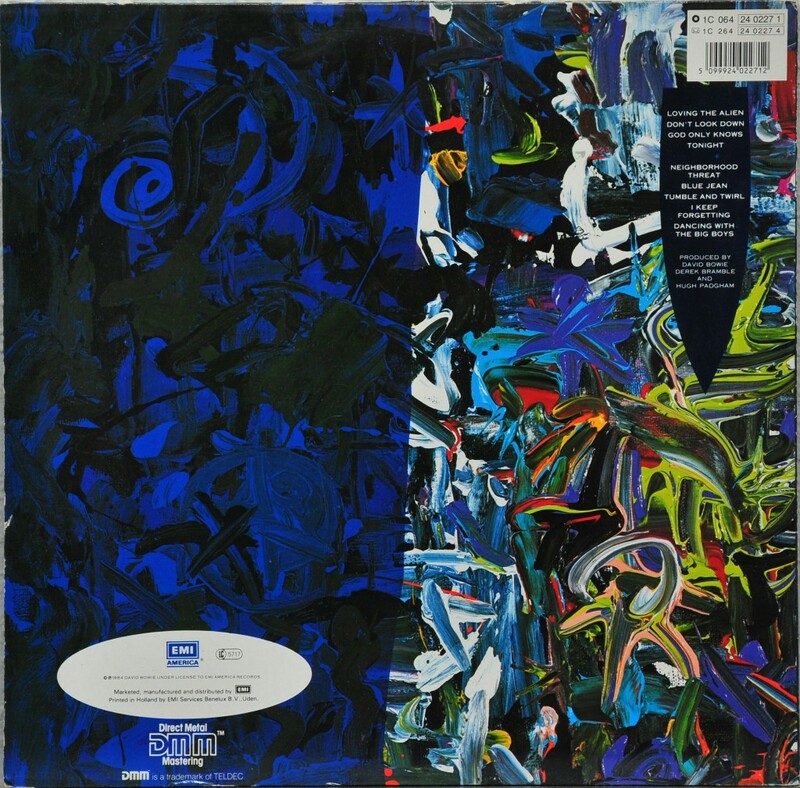 Oh, and get the 1990 Rykodisc version of Tonight if you can find it rather than the 1999 EMI remaster. Here’s a quick track-by-track rundown. Read my full analysis of the song here. Interesting reggaefied cover of a track from Iggy’s album New Values. Featuring a sublime David vocal, some excellent Bramble bass and a gorgeous horn/synth arrangement embedded in the mix, reminiscent of Gil Evans’ soundworld. Play loud. A great David vocal though very curious MOR arrangement of this Brian Wilson composition. Cavernous drums, soaring strings and acoustic guitar high in the mix. Fascinating though only really defensible if viewed as a kind of Scott Walker homage. Shorn of the shock heroin-overdose intro heard on the original which came from Iggy’s Lust For Life album. But it’s hard to defend this rushed, underwhelming filler which flopped as Bowie’s 1984 Christmas single. Even Omar sounds out-of-sorts on this. But let’s cut them some slack – David helped save Tina’s career. According to her, David dragged the bigwigs of Capitol Records out to see her perform live in New York against their wishes, prompting them to re-sign her. A brief, harmless bit of ‘sexist rock’n’roll’ in Bowie’s words, a portrait of a woman he fancied in a magazine ad. Padgham works his magic on Omar’s drums, there’s some window-shaking sax from Lenny Pickett and Bowie borrows Iggy’s baritone. The first single from the album, it reached UK #6 and US #8 and featured a watchable but very silly long-form video directed by Julien Temple, shown in UK cinemas as support feature to ‘A Company Of Wolves’. Another album highlight, co-written by David and Iggy, it’s an effective slice of tropical swing/funk with Bramble’s bass in Stanley Clarke mode, Guy St Onge’s cheery marimba, some sparkling 12-string guitar from Alomar and funny ‘muzak’ bridge with soothing backing vocals. Also some amusing lyrics inspired by Iggy and David’s vacation in Java. The album’s low point, where its ‘happy’, summery, positive feel comes truly unstuck. Electric drums fizz unpleasantly, David hams it up to little effect and the arrangements are more Pebble Mill than Muscle Shoals. Another Iggy/Bowie co-write, the album closes with a tasty piece of one-chord, horn-based techno-rock flash. A funny lyric that seems to be about American military might: ‘Your family is a football team’. Iggy is very audible on vocals. Arthur Baker also put together an ear-bleeding 12” remix which is worth a listen.